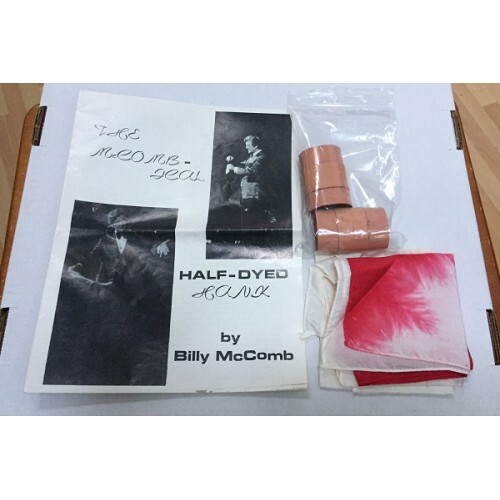 This was one of the late Billy McComb's signature effects. It's a solid five minutes of magic, laughs, and solid, commercial entertainment! This is a sucker routine in which the magician shows a red silk and pushes it into his closed fist. As the silk comes out the other side it is seen to have changed to white. The magician proceeds to explain how the effect is done: Two silks are now shown to the audience -- one red, the other white. The magician continues to explain how one silk is concealed inside the closed fist as the other is pushed in. Slowly you release the concealed one to make the color change. To make a long story short the magician appears to get caught when the audience knows two silks are used. Now for the smash finale'....the red and white silks vanish, leaving a half-dyed silk - red AND white - in its place! 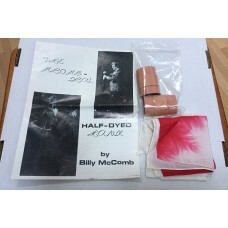 This is a working pro's routine and includes everything including the necessary 18" silk handkerchiefs, gimmicks, and complete instructions. In very fine condition... I'm not certain this set was ever actually used. NOTE - This is in my "Used/Collectible" category.... I have ONE ONLY.